"Religion" is a bad word these days it seems. Most people have a very negative understanding of what religion is and how it plays out in regular life. In fact, the largest growing religious group in America are the so-called "Nones" - those people who, when asked with what religious tradition they affiliated, answered "None." Indeed, according to a 2014 Pew Research study, approximately 23% of American adults claim no religious affiliation. Why does religion put such a bad taste in the mouths of one quarter of the U.S. population? Perhaps it is because religious groups are often affiliated with political groups. Or perhaps it is because the usual picture of religious life is one of puritanical rule-following and empty ceremony and tradition. Whatever the reason, the word "religion" is becoming increasingly pejorative in our culture. Even Christians can have very negative understandings of what religion is. I have a friend who once had a shirt that read "Religion is dead. God is not." Many people avoid the term "religion" altogether, and instead opt for the more palatable qualifier, "spiritual." You've no doubt heard someone say in describing themselves, "I'm not religious, I'm spiritual." 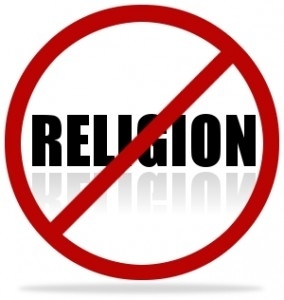 To the extent that the modern understanding of religion is associated with political ideologies, legalistic rule-following, and empty ceremony, I'll throw my hat in with the "Nones." I have no desire to be affiliated with that kind of religion. Indeed, it is possible and even very common in our country for religion to be something of very little substance, and often times choked with ceremony and tradition that is void of substance and is only carried out for its own sake. This kind of religion is empty, false, and completely unprofitable. And, most unfortunately, you don't have to visit too many churches in America before you run into this kind of religion. But the Bible does not consider "religion" to be a bad word. On the contrary, religion can be a very good, profitable, and God-honoring thing. First, in order for religion to be of any value, it must connect the mind, heart, and body of the individual. That is, right beliefs must translate into right actions. "If anyone thinks he is religious and does not bridle his tongue but deceives his heart, this person's religion is worthless." (James 1.26) If you claim a set of beliefs, your actions need to match your beliefs. If your religion has no impact on your life then it's worthless, because your beliefs ring hollow to the extent that they have no power to change how you live. If you espouse belief in a set of truth claims (such as the Bible, for example), your belief must be displayed in your life. And not just in ceremonies and traditions, but in real, tangible ways such as your speech. Do your beliefs change the way you think, act, and speak? If not, your religious practice is worthless. You're a "None" and you don't even know it. Second, religion that is true and right and pure is religion that is practiced in accordance with the word of God, and is in itself a reflection of the heart, mind, and will of God. "Religion that is pure and undefiled before God the Father is this: to visit orphans and widows in their affliction, and to keep oneself unstained from the world." (James 1.27) God has revealed in his word what is important to him: the things he loves, hates, how he acts, what is right, what is wrong, etc. God-honoring religion is living a life that responds rightly to what God has revealed in his word - it's knowing God's heart, mind, and will, and then living in accordance with that knowledge. The example in James 1.27 is that of orphans and widows. God has a special place in his heart for orphans and widows and those on the margins of society. He has a special love, care, and concern for them. Religion that honors God, then, is to have a heart that mirrors God's love and care for orphans and widows. But it's not just limited to orphans and widows. Genuine religion mirrors God's care and concern for all things that he has revealed in his word. Genuine religion is concerned with care for the poor; genuine religion is concerned with holiness and righteousness according to God's commands (or, as James says, "to keep oneself unstained from the world"); genuine religion is concerned with conducting my relationships according to biblical principles; genuine religion is concerned with conducting myself in business and at my job in accordance with God's word. The list goes on and on. The practice of obedience to what God says to do is the purest and best practice of religion. If the word "religion" puts a bad taste in your mouth or bad thoughts in your head, chances are that you have either participated in a religion that is more concerned with ritual and ceremony than actual obedience to God's word, or perhaps you've had a bad experience with people who claim allegiance to this religion or that, and so you've decided to be one of the "Nones." If that's the case, you need to know that your experience with religion has only been with false religions and worthless religions - not the religion of the Bible. The religion of the Bible is one that has power to change lives and make people more like God. True, pure, and good religion is always done in accordance with God's revelation of himself found in the Bible. Far from being a bad word, "religion" can express the deepest and most precious truths of the Christian faith, if we will practice it according to God's word.